As a kind of response to all the rumors that every day appeared about it, Google has just launched Android O Developer Preview 1 without prior notice. The first alpha version for developers is available without first passing through their announcement and presentation in the famous Google I/O event. Although it has been almost a year since the first alpha version of Android N, the new version of the operating system is scheduled for late 2017. And for now there are no big news of cosmetic type, rather small improvements in the finish that will inevitably also improve the user experience. Since this is a first alpha version, we do not recommend installing on daily and necessary smartphones; but if you can not wait to try it or are curious to see what's new, try to do so on secondary devices with the possibility of installing the next version of Android. Moreover, not all the additional features planned for the debut of Android O are already present. This version of Android O is in the wake of its development and other features will come over time. There is still a lot of work to do based on stabilization and performance. 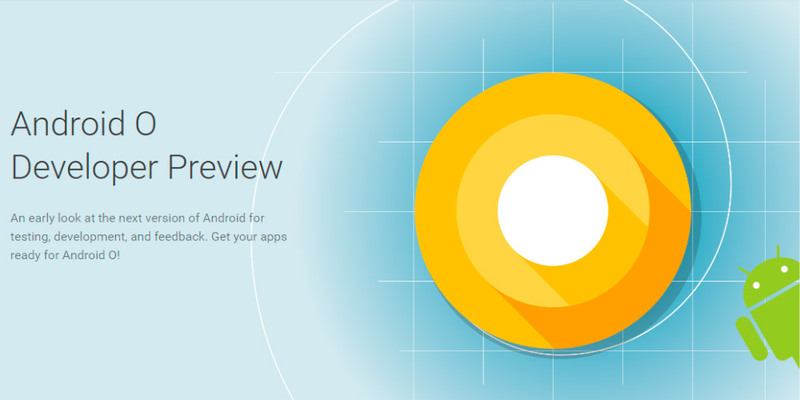 Taking into account, therefore, that this is a still embryonic version of what Google will offer within several months, the first Android Developer Preview is available via OTA for all users enrolled in the Android beta program. To install the firmware, it is necessary to download the factory image from the official website and have one of the necessary devices and tools. Android Developer Preview 1 is now available for download on the following devices: Pixel and Pixel XL; Pixel C; Nexus Player; Nexus 5X and Nexus 6P. But what's new in Android O? Android O introduces a number of new features and advanced APIs that can be exploited by developers. Here are all the news as reported by Google in its blog. This is: continue with the work they started on Android Nouat giving priority to improving the battery life and performance of the devices still being interactive. To make this possible, they have put additional automatic limits on which applications can be kept active in the background, in three main areas: implicit transmissions, background services and location updates. These changes will make it easier to create applications that have minimal impact on the user's device and battery. The limits on background apps represent a significant change in Android. Android O sets new Notification Channels, which are new content categories defined by the content. Channels allow developers to offer users detailed control of different types of notifications. Not only that, users can block or modify the behavior of each individual channel. Android O also adds new visuals and notifications effects that make it easier for users to see what is happening when they have an incoming message. Android users already rely on a large number of password managers to automatically enter codes and repetitive information. Now Google is doing this work through the ecosystem by adding support within the platform for autofill passwords and payment methods. Users can choose an application to autofill everything, similar to how to select an application for the keyboard. The autofill API secures user data, such as addresses, usernames, and even passwords. Picture-in-picture (PIP) display is now available on smartphones and tablets, so users can still watch a video while responding to a chat. The application can be put into PIP mode or changed if the system supports it. Fonts are now a type of resource fully compatible with O. Android applications can use fonts in XML design, and define character families in XML. To help integrate better with the user interface of the device, developers can now create icons that adapt to the system in different ways, based on a selected form of the device. Changes to the system also interact with the icons and the launcher: connections, settings, dialog windows and the widescreen. Application developers can now benefit from new devices that have a screen with a wider color gamut. For maximum audio fidelity, Android O now supports high quality and Bluetooth audio codec like LDAC. Also added are new Wi-Fi features such as Wi-Fi Aware, formerly known as Neighbor Awareness Networking (NAN). On devices with appropriate hardware, applications and nearby devices can communicate over Wi-Fi without an Internet access point. Google is working with its hardware partners to bring Wi-Fi Aware technology into devices as soon as possible. With the advent of Google Play applications on Chrome OS you are seeing an increase in the use of keyboard navigation within these applications. With Android O they have begun to focus on building a more reliable predictable model for navigation that helps developers and end users. AAUDIO is a new native API designed specifically for applications requiring high performance and low audio latency. The Developer Preview incorporates a first version of this new API for feedback from developers. In this case, it is worth mentioning the collaboration with Sony. On Android O, the default multi-process mode is allowed and adds an API to handle application crashes and errors, for greater security and better application stability. Android now supports several of the new Java languages, including the new java.time API. In addition, Android runtime is faster than ever, with up to 2x improvements on some benchmarks. Hardware manufacturers and partners have accelerated fixes and enhancements for the Android O platform. For example, Sony has contributed in more than 30 enhancements to various features including the LDAC codec and 250 bug fixes for Android O.